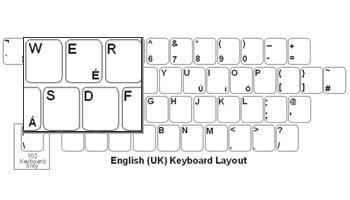 United Kingdom (English) keyboard labels are an affordable way to convert any keyboard to a United Kingdom (English) keyboard with high quality labels for years of use. These opaque labels will completely cover your keyboard's original legends. White Letters on Black Background. United Kingdom (English) labels are a very economical option for creating a United Kingdom (English) keyboard. The language labels use an easy peel-and-stick method to install. They will not damage the original keyboard key. The letters are printed on the underside of the labels so that the lettering will not wear out. This affords you with many years of durable use.This label supports the keyboard layout for United Kingdom (English). This language is supported in Windows 7, XP, Vista, ME, 98, and 95. Characters that require the AltGr key appear to the left in the DataCal labels (see illustration above). On the number keys, the AltGr characters are centered at the bottom of the label. Shifted AltGr keys are centered at the top of the label. For alpha keys, the AltGr characters are in the lower left corner of the label. Shifted AltGr characters (if different from the lower case AltGr characters), are centered at the top of the label. To use the Alt key input method, hold down theAlt key on the keyboard and press the numbers indicated below for the desiredcharacter on the numeric keypad (note that the system only works with thenumeric keypad; it does not work with the number row across the top of the keyboard).